With the emerging and flourishing digitization of practices and an increased demand of online structural stores for everything from groceries to consumer goods, Trade has taken a swift turn to marking its presence on internet with a huge number. Thinking to shift your shop into a proper Online Store, or better - a Marketplace? What are the question you ask before choosing your platform to trust your business with? With so many options available in the market scaling from Virtuemart to wooCommerce to something more refined like Magento, it’s typical to find yourself lost and confused in the jam of Software. We know the need of researching a Platform for your Store far down from the top and surface before you settle down at one, and we have covered all that up for you here. 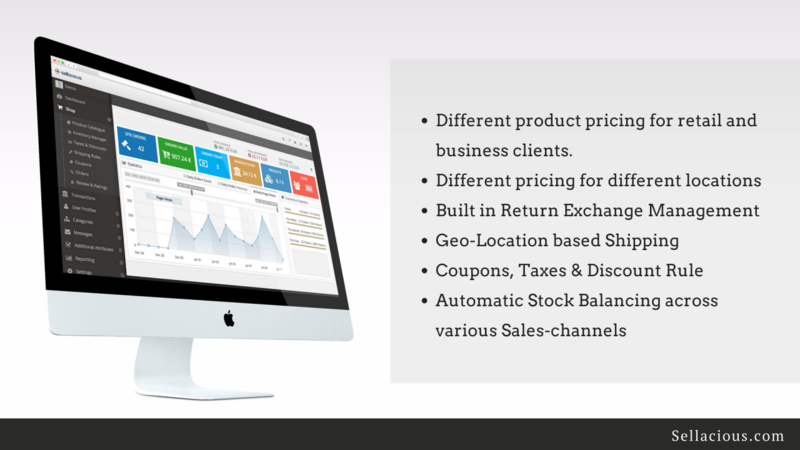 We are not bragging but Sellacious comes loaded with all the features you require to ensure your store runs smoothly, cost effectively, and successfully for the growing years. 1- Sellacious asks for extremely less efforts. 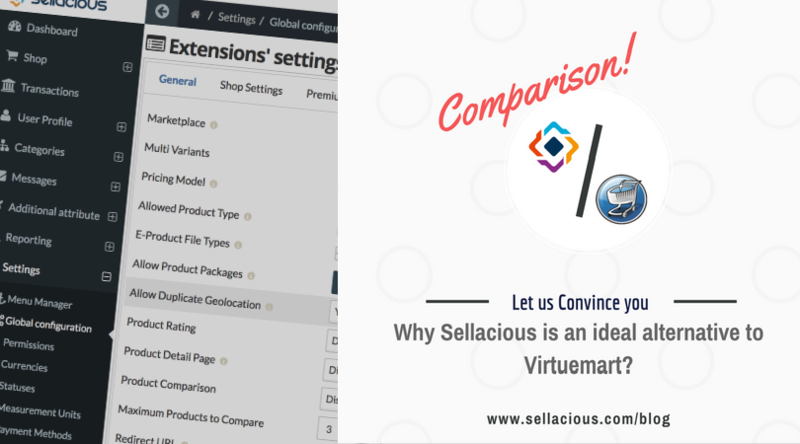 As we claim and ensure, Sellacious is a complete solution for your store and requires almost no extra plugins, still maintaining the flexibility to match your needs,Sellacious lets you customise the same according to your specifications. Download our quickstart package and you can get an online marketplace or store up and running within 10 minutes. 2- An All-Rounder. Sellacious thrives to render an all-round platform offering RMA (Returns and Exchange), Automatic Stock Balancing across various sales channels, Orders Management, Geo-Location based shipping, payments, coupons, taxes & discount rules and much more on the back of user’s hands, jacked up with Multi-Site feature enabling the user to manage multiple sellacious installations from single sellacious installation. Current available solutions in market comes with hidden cost where you have to pay for all the little customisations to make it work in a real world. Sellacious, on the other hand, is a complete solution in itself and requires extremely less external plugins which saves you a huge cost on additional integrations. Sellacious is absolutely free to download and thus goes easy on your pocket. Payment and checkout shall never be a problem for the customers, with so many payment and shipping integrations available, you can choose to add any to your store and combine it with Sellacious easy checkout process, it lets you in fact modify the checkout fields directly from Sellacious as per requirements, to give your buyers the ease of ordering with customization of your products enabled.You can also let your guest do the checkout without even letting them register on your store. Sellacious comes with all the features to support your Store’s Marketing, with so many features for logical marketing, SEO and modifications of various SEO settings to suit your essentials. One of the tested and certain ways to boost your store is to reduce its loading time giving your buyers a nice shopping experience. Sellacious also ensures a robust interface which helps you maintain and run your store in the best speed possible. We know you must have questions, and we try to be connected to our user’s in as many ways possible, offering 24*7 live support, active Community forum, written documentation, video tutorials to make it easier for you to understand and much more. Love to code? Sellacious is built with the modern code standards in industry thus enabling easy development on the platform. The Joomla! MVC structure is the core of Sellacious, which makes it especially easy to extend and customise as per your requirements. Download, Install and get going with starting your own online store or marketplace. Security is one of the main concerns while running an eCommerce since it involves so many transactions, Sellacious here plays its part in ensuring the security that is required as it maintains the latest code standards and performs regular code audits to fix any unforeseen vulnerabilities. Sellacious has emerged as one of the reliable software in recent times and focuses on understanding its user’s experience, And so, have introduced the idea of Trial of our Platinum package for a period of time to let you perceive Sellacious for yourself with its every element. There are plenty of options available out there, And we understand choosing the one that suits you is a heavy investment of time and money. Try Sellacious for your next big thing, We are sure we won’t let you down. With all the features that we offer, It is only in the direction of your store’s Success. Before settling to any random option, we encourage you to research what’s best for you according to your current needs. Stay connected for more. We have more than this in store.